Um die am Didgeridoo interessierte weltweite Spielergemeinschaft zu erreichen und zu inspirieren, hatten wir uns (2002) entschieden, nicht in den typischen wissenschaftlichen Fachmedien zu publizieren. Weil dort häufig die Publikationen durch den Wettbewerb zur Erhöhung von Publikationsindizes und zwanghaftem Erstveröffentlichungswillen getrieben sind. Aus diesem Umfeld existieren inzwischen Fälle, wo partiell Informationen aus unserem Projekt ohne Quellenangabe verwendet bzw. vorhandene Quellen unvollständig gelistet werden. Erkenntnis, dass die Klangcharakteristiken wesentlich durch die Innenformen (durch Termiten zufällig ausgefressen oder handwerklich erzeugt) bestimmt werden. Erste Versuche mit modifizierten Slide-Didgeridoos (Eigenbau). Entwicklung des „Test-A-Doo“ zur experimentellen Überprüfung verschiedener Innenformen während des Spielens. Anwendung der Transmission-Line-Methode zur Simulation von Impedanzspektren komplexer Didgeridoo-Innenformen zur Bestimmung anspielbarer Overblows. Entwicklung der Wasserstands-Methode zur Rekonstruktion von Querschnittsverläufen interessanter Didgeridoo-Innenformen. Entwicklung von Methoden zur Simulation von Klangspektren komplexer Didgerodoo Innenformen und der ersten CADSD-Software (Computer-Aided-Dideridoo-Sound-Design). Erklärung von Singtönen und Mischtonverstärkung. Erste deutsche Ausgabe des Buches „Das Didgeridoo Phänomen“ und Erklärung der Innenformabhängigkeit der Klangausprägung in Didgeridoos. 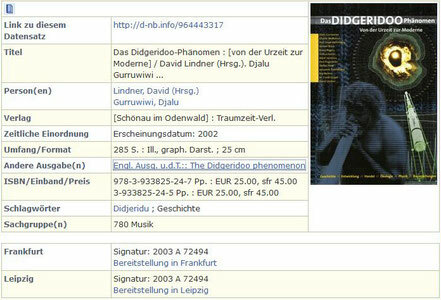 "Das Digital Design Didge" / "The digital Design Didge"
Erste englische Ausgabe des Buches „The Didgeridoo Phenomenon“. Erforschung und Erklärung des Oberton-Wobble-Effektes bei Yidakis mittels NEAL-Spieltechnik. Beschreibung und experimentelle Bestätigung der Wechselwirkung von Intensität der stehenden Wellen im Instrument verursacht durch Eigenresonanzen der Luftsäule und der Schallenergieübertragung an die Umgebung durch Übereinstimmung der lokalen Schallauslenkungs-Maxima bevorzugter Obertöne mit dem korrigierten Bellend zum Design prominent singender Didgeridoos. Unser besonderer Dank gilt den nordaustralischen eingeborenen Völkern der Ursprungsgebiete des Didgeridoos, ihrer faszinierenden Spieltechniken und ihrer Talente im Yidaki- und Mago-Bau. Die durch sie erfahrenen musikalischen und emotionalen Erlebnisse haben uns inspiriert, dieses private Forschungsprojekt voranzutreiben. Es gibt noch viel zu entdecken. To reach and inspire the world-wide player community interested in the Didjeridu, we had decided (2002) not to publish in the typical scientific specialized media. There the publications often driven by the competition for increase publication indices and the will of compulsive first publication. From that surrounding field in the meantime cases exists, where partially information from our project without indication of source is used and/or existing sources are listed incompletely. Knowledge, that the sound characteristics are determined substantially by the interior forms (by termites coincidentally eaten or handmade). First experiments with sliding elements in didjeridus (handmade). Development of the “Test-A-Doo“ for the experimental examination of different interior forms during playing. Use of the transmission line method to simulation of impedance spectra of complex Didjeridu interior forms for the determination of playable overblows (toots). Development of the water level method for the reconstruction of cross-sectional contours of interesting Didjeridu interior forms. 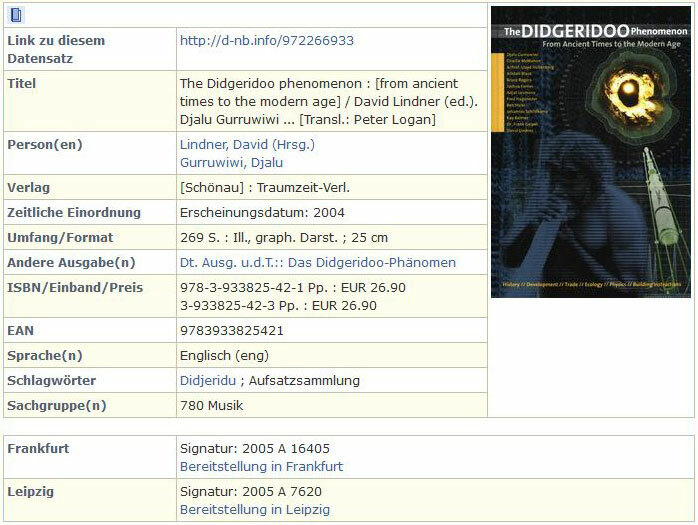 First German expenditure of the book „The Didgeridoo phenomenon “and explanation of the interior form dependence of sound development in Didjeridus. 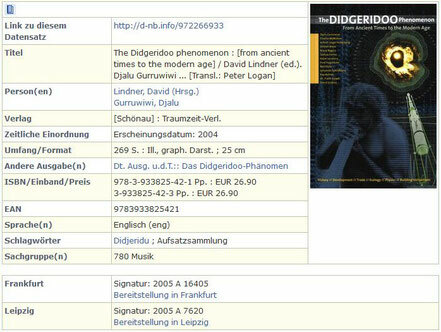 First English expenditure of the book „The Didgeridoo Phenomenon“. Study and explanation of the harmonic wobble effect during Yidaki playing with NEAL style. Study and explanation of the heterodyne amplification during Mago playing with WAL style. Installation of new knowledge into the first high performance CADSD version. Start of the Didge(R)Evolution project. First directed evolution of Didjeridus with free definable physically possible sound and play characteristics. Definition of 'Pseudo Toots' and first sound design of instruments with targeted playable 'pseudo Toots'. Description and experimental confirmation of the interaction of intensity of standing waves in the instrument caused by intrinsic resonances of the air column and the sound energy transmission to the environment by matching the maxima of local air-displacement of preferred harmonics with the corrected bell end for the design of prominent clearly singing didgeridoos. Our special thanks regard to the north-Australian indigenous people of the origin areas of the Didjeridu, their fascinating playing techniques and talents in Yidaki- and Mago-crafting. The musical and emotional experiences in that field inspired us to advance this private research project. There is still much to discover.